What Are Tennis Balls Made Out Of? From the pressurized rubber core to the felt covering, man-made materials make up most parts of a tennis ball. In some cases, recycled PET plastics are used to make the felt that covers tennis balls. The International Tennis Foundation sets rules that govern the standard size, composition and coloring for official tennis balls. Today's tennis balls are made of a hollow, two-piece rubber shell filled with pressurized gas. The rubber shell is covered with felt made from nylon or wool. The ITF states that tennis balls should be between 2 1/2 and 2 5/8 inches in diameter and weigh between 2 and 2 1/16 oz. The felt used to cover tennis balls destined for official play is bright yellow. Tennis ball manufacturers mold rubber into two shapes that are pressed together to form the core of a ball. To achieve an appropriate level of bounciness, tennis ball makers inject a specific amount of pressurized air into the center of each rubber core. Manufacturers buff the sealed, pressurized rubber balls and cover them in glue. Machines cut long pieces of bright yellow felt into two shapes that are wrapped around each tennis ball to form a covering. Ball makers heat the completed tennis balls to make the glue form a seal that holds the two pieces of fabric together. Tennis was first played in the 1870s, and the first tennis balls were made from leather or cloth and filled with rags or horsehair. Rubber tennis balls were developed in India and quickly became the standard for lawn tennis games. Players added flannel coverings to rubber tennis balls to increase their durability. To increase the tennis ball's ability to bounce, ball makers began adding pressurized air to the center of the rubber core. 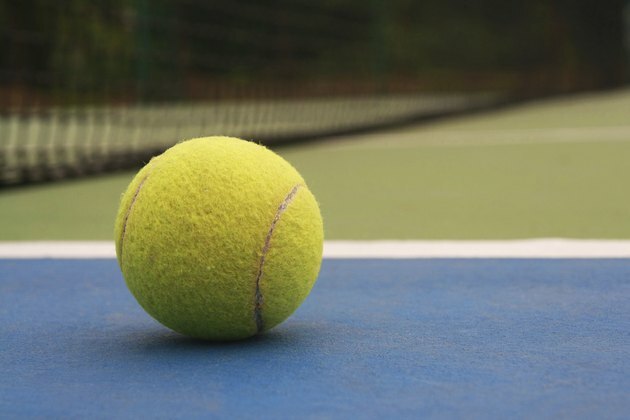 Originally, tennis balls were black or white, but the ITF introduced yellow tennis balls in the 1970s because the bright color made the balls more easy for television viewers to see. The ITF states that tennis balls must bounce between 53 and 58 inches high after being dropped onto a concrete floor from an elevation of 100 inches. To achieve this precise bouncing height, tennis ball makers add a very specific amount of air to the core of tennis balls. In general, tennis balls are pressurized to 12 pounds per square inch. Made Man: How is a Tennis Ball Made?